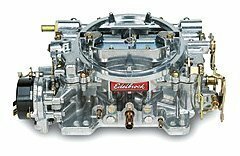 The Edelbrock Performer Carburetor features two-piece aluminum construction for cooler operating temperatures and less warping. There are no gaskets below the fuel bowl level for fewer leaks and no plastic parts or power valves to blow out. It uses easily changed metering rods for precise tuning and the primary venturi booster is a bottom-feed design for smoother acceleration and better drivability. It controls the float level, atomizes the fuel into a useable air / fuel mixture in the proper proportions and transition between circuits. Carburetors by Edelbrock. Edelbrock Performer Series Carburetors Features - Hook your Carb'd ride up correctly with our Carburetor Calculator. Click here and plug in your engine info. Add and infusion of carbureted muscle to your ride with Edelbrock Performer Series Carburetors. Edelbrock carbs work right out of the box-bolt 'em on and go. Delivers crisp throttle-response, incredible horsepower gains and unmatched reliability. Perfectly fits your spread-bore or square-bore intake manifold. Edelbrock Performer Carb - Best Price & Free Shipping on Edelbrock Performer Series Carburetors - Satin, Black Powder Coat, Endurashine Finished Carbs. For the top selection of Edelbrock Fuel Systems shop online today. The Edelbrock Performer Carb - Best Price & Free Shipping on Edelbrock Performer Series Carburetors - Satin, Black Powder Coat, Endurashine Finished Carbs will improve and personalize your vehicle. Carburetors by Edelbrock - selected by many auto enthusiasts in the top automotive discussion forums. Edelbrock Performer Series Carburetors for your vehicle will deliver the results you are looking for! Edelbrock Performer Series Carburetors - Fuel Systems - Carburetors. Edelbrock Performer Reman Carburetor 4-Bbl 500 CFM Air Valve Secondaries 9904 -- Summit Racing Orders Over $99. Receive Free Shipping. Edelbrock 1403 Performer Carburetor -- Jegs ? Selection, Value, Lifetime Support Since 1960? Edelbrock 1403 Performer 500 CFM 4 Barrel Carburetor, Electric Choke -- Speedway Motors - We?re Partners In Your Passion! Edelbrock 1403 Performer Series 500 CFM Electric Choke Carburetor Non-EGR -- 60 Day Returns. Fast Shipping. Trusted Dealer. 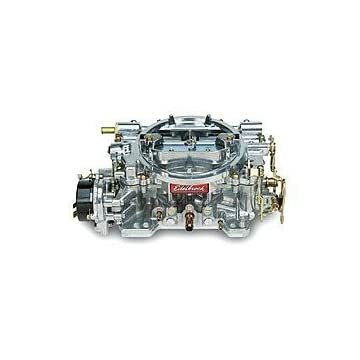 Edelbrock 1403 Performer Series Carb -- Ships Out Fast. 60 Day Returns. Dependable Dealer. Store: Performance Racing Parts For Less Condition: Brand New Price: $405.95 Total Price: $405.95 Buy It from Performance Racing Parts For Less No returns. Edelbrock - 1403 - PERF CARB 500CFM - -- Fasttrack Auto - #1 In Perfomance Parts! Last updated: April 20, 2019 at 11:48 EST. Pricing information is provided by the listed merchants. GoSale.com is not responsible for the accuracy of pricing information, product information or the images provided. Product prices and availability is subject to change. Any price and availability information displayed on amazon.com or other merchants at the time of purchase will apply to the purchase of the product. As always, be sure to visit the merchant's site to review and verify product information, price, and shipping costs. GoSale.com is not responsible for the content and opinions contained in customer submitted reviews.